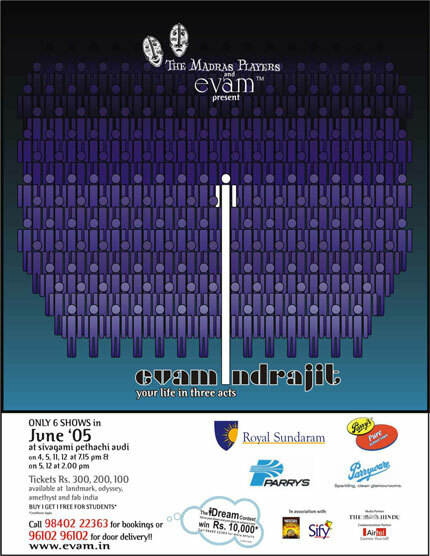 What is evam Indrajit about? Its a story of discontent, of unanswered questions, of repressed emotions and above all, its the story of the youth. The play discusses a number of issues that we face as a part of growing up. It raises questions such as Who are We?What are We? and Why are We? Questions that can seem so pertinent to a 22 year old looking for answers while looking equally senseless to his mother who seems to forget that there was a time when similar questions perturbed her. 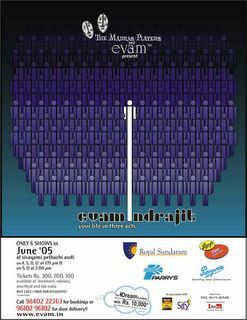 Its a play about Amal, Vimal, Kamal, Indrajit, Manasi and Aunty- it tracks their lives from carefree college-goers to anxious job searching professionals to the baggage of family life and through all this the Writer takes us through the rigmaroles of Indrajit's mind, his fears, apprehensions, his romance and his heart-break. The play captures the different ways in which life evolves from say a happily married couple who can't keep their hands of each other to a gruff husband who considers the newspaper to be the most important item in his "things-to-do". What happens to Indrajit?Does he find answers or does he get crushed under the weight of his questions? To know more, please come and watch the play! Hey Saaransh , good luck with them dude.. and what exactly are these plays about ?? Is there a social message or is it just a parody..sorta play? ?